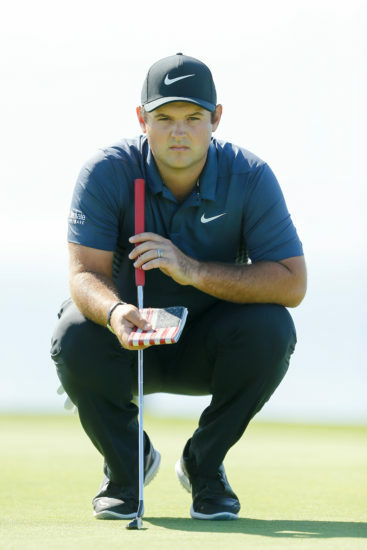 PATRICK REED IS A PROUD TEXAN, PATRIOT AND RYDER CUP PLAYER. While he’s been in the headlines for a number of PGA TOUR events, the 26-year-old is credited for leading Team USA in singles with a 1-up win over Rory McIlroy during the 2016 Ryder Cup. Patrick played a pivotal role in helping the United States secure a victory over Europe at the 41st Ryder Cup held at Hazeltine National Golf Club in Minnesota. Nobody has played to the crowd more than Reed. His pairing with Jordan Speith led to a win that tied the American record of 5 points set by Gardner Dickinson and Arnold Palmer in 1967’s Ryder Cup. His memorable match-up against Rory McIlroy will forever go down in the books as one of the most exciting matches to be played in this format. A truly grueling day of trading birdies and sinking putts, the match came down to the 18th hole where Reed sealed the deal. That day, Reed played to a record gallery of 55,000 in a stellar display of energy and sportsmanship. Reed exchanged fist bumps, finger-wags, and bowing with McIlroy, who had never lost a match in Ryder Cup singles play. The Hazeltine fans cheered and chanted his name, and this warrior marched with immense pride in representing the country he loves. The 2015-2016 season was yet another superlative year for Patrick Reed, highlighted by a tied finish for 11th at the 2016 Rio Olympics. He also marked the season by winning The Barclays at Bethpage Black by one stroke for his first career FedEx Cup Playoffs win. The victory was Reed’s 11th top-10 finish in 27 starts this past season, second only to Dustin Johnson. It also marked his fifth TOUR title at age 26, joining McIlroy (23) and Spieth (21) as the youngest winners with five TOUR titles in the last 10 years. Justine Reed- Justine and Patrick Reed were married on December 21st, only two weeks after Patrick earned his PGA TOUR Card through Q-School. Justine caddied for her husband for two years and was there to see him earn his PGA TOUR Status and his first season win at the Wyndham Championship. Shortly after Patrick Reed’s first win at the Wyndham Championship, they found out they were expecting their first child. Patrick added two more PGA TOUR victories and two records, including becoming the youngest WGC winner ever at the World Golf Championships-Cadillac Championship. He also shot 63,63,63 at the Humana Challenge and went on to win the tournament while also claiming a PGA TOUR scoring record. Their daughter, Windsor-Wells Reed, was born two months later in May of 2014 and three and a half years and two more victories later, the couple welcomed their son Barrett Benjamin Reed in December of 2017. Both Patrick and Justine have said their children are the light of their lives. In 2018, Patrick won his first Major Championship at The Masters in Augusta, Georgia. “To win my first Major Championship at Augusta National, is a dream come true for me. This has obviously been a goal of mine, to win a major, to win tournaments and achieve this level of success and it took a lot of commitment and hard work to achieve this. I just want to thank everyone who helped me along the way because this is so special to me and always will be. I hope to use it as a building block for future Major success and hopefully this is just the start,” said Reed. JUSTINE GREW UP IN HOUSTON, TEXAS, AND WAS A MULTI-SPORT ATHLETE (SWIMMING, SOCCER AND GOLF). Justine received her education at Louisiana State University and Our Lady of the Lake College. Justine has a dual bachelor’s degree in Nursing and Health Service Administration. She is a licensed RN, and maintains her license to date. She also started The Team Reed Foundation in 2016 with her husband and is very involved, additionally running Team Reed Enterprises, Inc. (TRE). Justine still hopes to caddy in at least one of each of the four majors one day. KESSLER KARAIN IS JUSTINE’S YOUNGER BROTHER AND PATRICK’S BROTHER-IN-LAW. Kessler joined Team Reed in December 2013 when Justine could no longer caddy due to her pregnancy. Kessler was also a multi-sport athlete and graduated from the School of Business Administration from University of Texas-San Antonio. He was working for Medtronic in medical sales when he was asked to caddy for Patrick. Since Kessler joined the team, he has had four wins, five runner-ups, and 17 top ten’s with Patrick Reed. He has caddied in two Ryder Cups, one President’s cup, and the Olympics.